Ever get frustrated when trying to quickly transfer files because USB 2.0 crawls rather than runs? I’m sure many have been victims of the bus’ relatively slow transfer rate, especially when trying to read and write data containing videos or music. Until USB 3.0 becomes the standard, there are ways to get around USB 2.0’s inefficiencies. One alternative is to use eSATA, an external SATA interface which is much faster than USB 2.0. 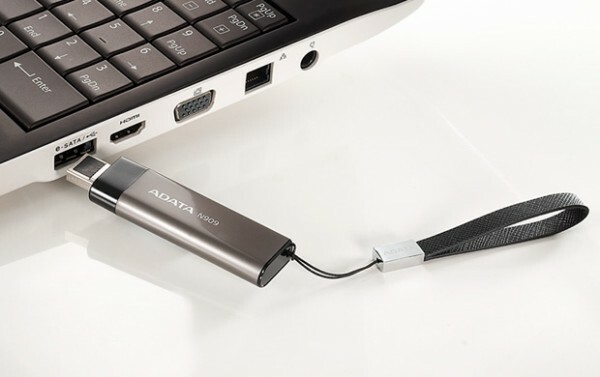 On that note, Taiwanese memory manufacturer A-DATA has just come out with the N909 thumb drive, the first in the industry to combine eSATA and USB 2.0. Combining both eSATA and USB 2.0 has some pretty great advantages. First of all, eSATA by itself is inconvenient in that it does not actually have any power pins. The combination of USB with eSATA means that the N909 does not need any external power cables as the USB interface takes care of it. USB 2.0, however, has its limitations, as typical read and write rates range from 10-20 Mbps. That’s where the N909’s eSATA interface takes over and boosts the transfer rate up to 90 MB/s and 50 MB/s for read and write performance respectively. To put it into perspective, a 4GB avi file would take about 80 sec to be write with the N909 versus 3.3 minutes with conventional USB 2.0. Of course, in order to utilize the N909’s eSATA interface, users will need to have an eSATA port in their computers. For people like myself who don’t have an eSATA port, there’s not much use for the combo solution. Also, while the speeds ADATA is claiming are fairly fast, the actual speeds may be much lower when actually benchmarked. The N909 is compatible with USB 2.0 slots but with a rate up to 33 MB/s. This rate is also subject to variation when using the device. The real rate may be somewhere in the 25-30 MB/s range which is still faster than USB 2.0. While I can imagine transferring a large amount of information via the eSATA, I can only imagine using the USB interface like a regular flash drive. In terms of physical appearance, the N909 sports an aluminum body and a green LED power indicator making for a sleek and simple look. The device will be available in 16GB, 32 GB, and 64 GB. Even if you don’t have an eSATA port, atleast the capacities are somewhat appealing for now. That though might change as the pricing of the N909 has yet to be announced. The N909 is no USB 3.0, however, the combination of eSATA and USB 2.0 seems to be a decent alternative. Although there still is no set release date, the N909 should be hitting stores soon.